Governor Jay Nixon says his Department of Revenue is not feeding a database of personal information on Missourians who have applied for driver’s and non-driver’s licenses and concealed carry permits. 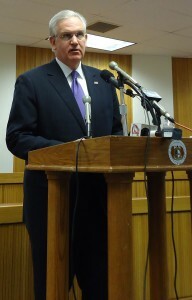 Governor Jay Nixon answers reporters’ questions after speaking to the House Republican Caucus. Nixon has responded to the recent issues raised primarily by legislative Republicans over the Revenue Department scanning personal documents from those applicants. Asked directly whether the Department is enforcing the federal Real I.D. Act, Nixon says he thinks it is not. The Revenue Department has testified that copies made of driver’s license and concealed carry permit applicant information has been stored at the state data center. It says that same data is currently sent to a private company, MorphoTrust USA in Georgia, where licenses are printed. The company is then supposed to destroy the pertinent data. Nixon says the issue did not come up when he spoke to the House Republican Caucus today about Medicaid expansion and reform, the issues he says lawmakers should be focused on. Click here to see the video on Missourinet’s Youtube page of Nixon fielding the Revenue Department questions.